It’s time for a new sketch at Freshly Made Sketches. This week our sketch hostess is the wonderfully talented Jen Mitchell. You’ll want to check out Jen’s blog as she creates the most beautiful clean cards – I’m in awe of her creations. Being on holidays with a fair amount of my craft room is great, but being home to my fully stocked craft room is heaven! It was almost a relief to be able to put together a card without having to think too hard about what products I had taken with me that matched. We would love for you to join us with this challenge. 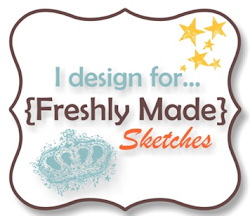 If you need some inspiration head over to Freshly Made Sketches and take a look at the wonderful inspiration from the Design Team. Love those beautiful flowers on your branch! Beautifully layered as always! Hope your holiday time was wonderful! Oh,i love this card,Narelle!! Love the beautiful flowers and patterns!!! Gorgeous! I love how you just colored the centers of the flowers – so artsy! And the horizontal layers are genius! I absolutely adore this, Narelle! The yellow is so cheery, and the way you’ve colored the flowers is just beautiful. This is beautiful! The spiral punch along the bottom really adds a surprising and gorgeous look. Such a beautiful card Narelle! I love those flowers! You cut them so nicely! Love the yellow with the crumb cake! Beautiful combination! This card is so gorgeous, Narelle. As always, the perfect pairing of colors and DSPs, as well as the fabulous coloring and layering, makes this another jaw-dropping beauty! Perfect use of the sketch. 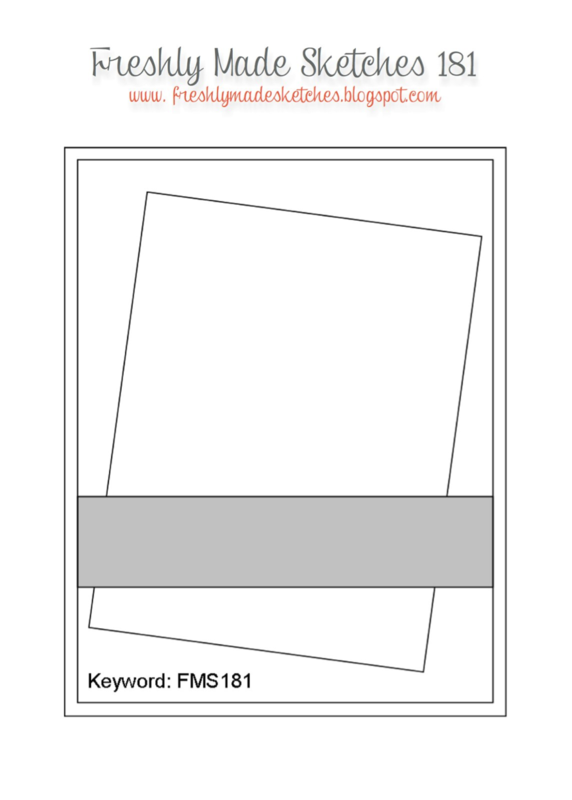 I love the crossing panel element. Fabulous. And of course the flower is classic “you”!